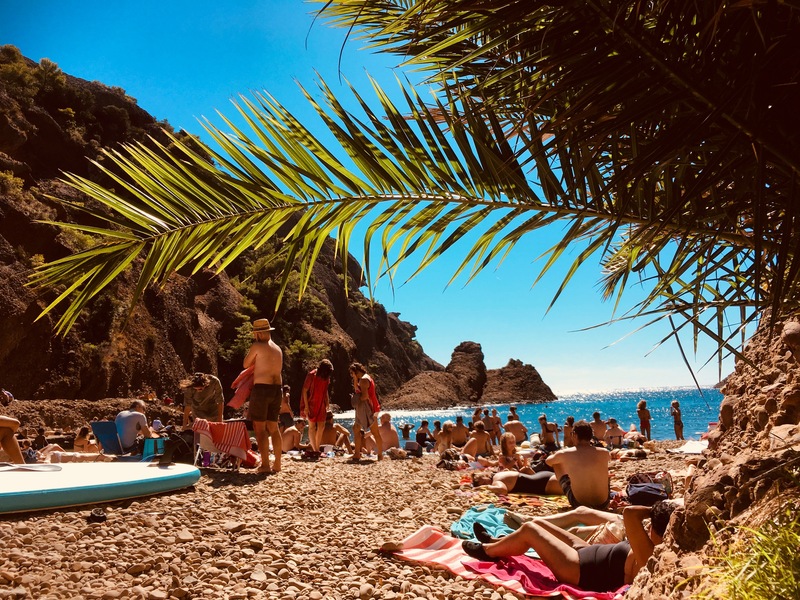 The region between Côte d’Azur and Provence is a playground for budget travelers and backpackers. Swim, hike, drive, dream, watch, get high, play, stroll, eat and drink around that amazing part of France. We went there for a week and stayed with French friends, that showed us some amazing spots. 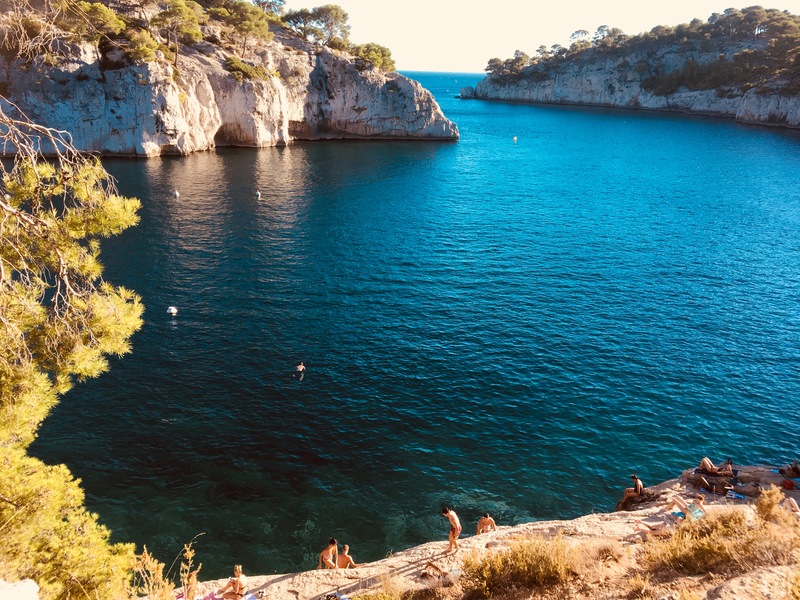 We want to share our best experiences: 11 budget travel highlights on the way from Marseille to Nice to make the most of your backpacking trip. Walk between colors, fashion boutiques, small cafés, running rats, garbage containers, fancy souvenir shops and a diverse smell of new trends and broken dreams. Whatever you think, when entering the old town of Le Panier in Marseille, don’t forget to open your eyes. 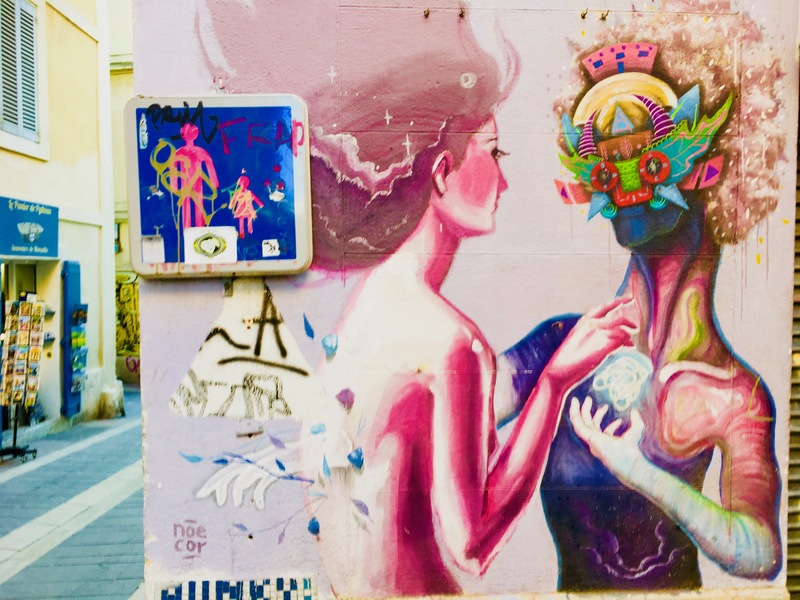 The quarter of Le Panier in Marseille is probably one of the most amazing street art outdoor galleries, that I have ever seen. 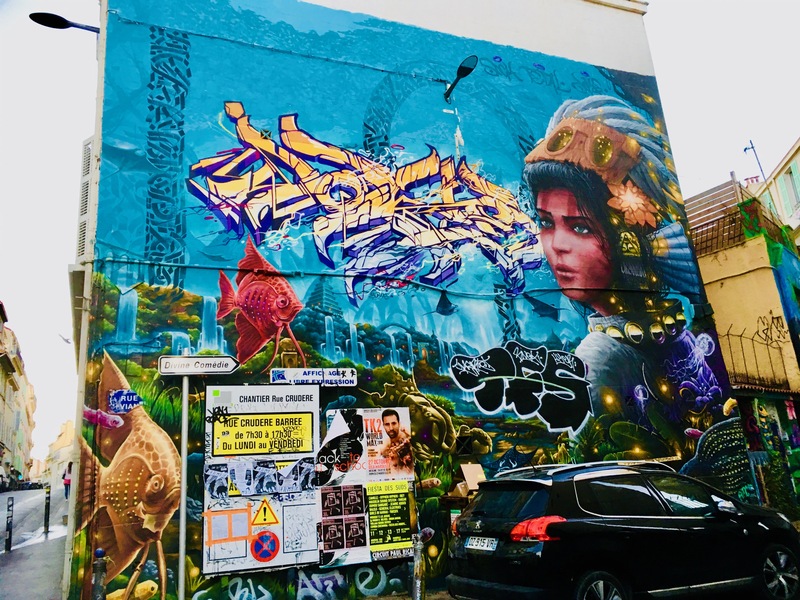 We felt entertained for hours by walking around between the most colorful and inspiring graffiti of Marseilles. To be honest, I didn’t like Marseille in general right from the start. It was loud. Full of people. I thought, it was a bit run down somehow. Hey, it’s the second biggest city after Paris and the oldest in France. I didn’t experience Marseille as a classical sightseeing spot and wouldn’t recommend it as a honeymoon destination, even if there might be a few nice spots around the harbor. But Marseille is authentic. It’s real. Not made up for tourists. My approach was to feel the heart of the city beating, live the French way without spending too much money. It took me a short time to get into the right mood. But Marseille got me. I still feel its heart beating. I still taste the Pastis on my tongue, that we had in a cool bar in the quarter of Noailles. The café „Au Petit Nice“ is a perfect place for budget travelers, who want to soak in French love of life in a lively outdoor sitting area among smiles and laughter in a lovely warm summer night. We got the Pastis for around 2,50 Euros per drink. Noailles is the budget traveler’s heaven: Have lunch or dinner in a kind of Mini Maghreb first, walk around between market stalls and halal butcher shops after, enjoy street art, see young people gathering in hip bars, check the windows of cool book shops, allow yourself to lose yourself. It could be the way to paradise: Whoever felt the green and blue of the Gorges du Verdon, probably wants to return again and again. The soft water and the rough canyon are a perfect scenery for a tour on an electric boat, a kayak tour or a hike. It was my first time behind the steering wheel of an electric boat. The great thing is, that you don’t need a license for that. Luckily, the boat was slow enough to be able to hold the steering wheel in one hand and a drink in the other one. Our French friends invited us to a great tour. We have been there by the end of September and had the Gorges nearly to ourselves. The water wasn’t hot anymore, but still okay for a swim. Well, all the attractions, that you pass on a boat trip through the Gorges du Verdon need a little bit of imagination to get recognized as fascinating sights. But it is really fun to float through the canyon with a map from the rental boat office trying to identify all the holes in the walls that are meant to be caves, prehistoric fireplaces, bat caves and hideouts of the résistance in the second world war. 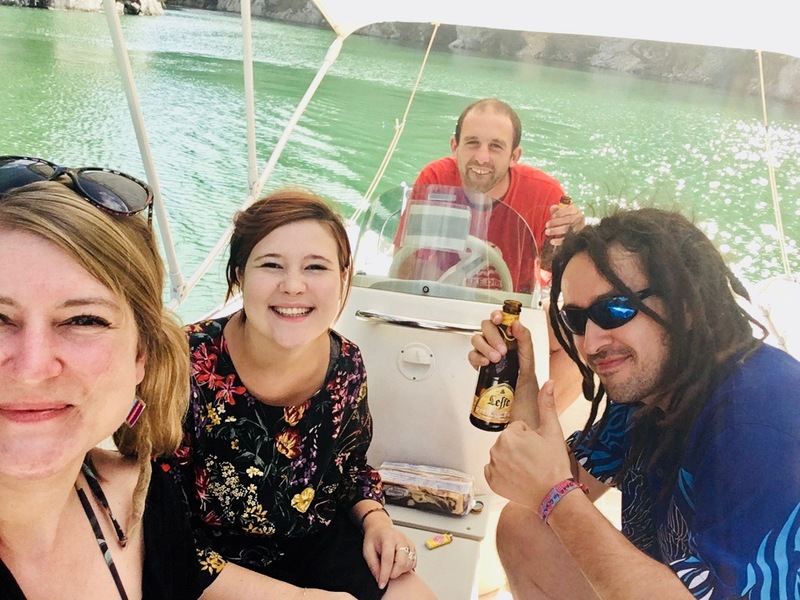 If you are there with a group of four to six people, it is really worth to rent a boat for a 5-hours-trip, so that you are able to reach the Lake of Esparron. We paid 86 Euros fort hat in low season. Well, we paid even more, but that’s because we were too stupid to return in time. Boat rental prices start in the low season from 20 Euros per hour for a small family boat. And if you really travel on a budget, you can also walk your way through the canyon! There are hiking trails just next to the water. They looked like fun challenges. We rented our boat from Verdon Electronautic. There is also a variety of multiple day hikes around Gorges du Verdon. My French friends call it the fake city. Maybe, because Aix-en-Provence has no Mini Maghreb like many towns in the South of France. Maybe because the kebab price in the main pedestrian streets can be around 7 Euros and the ladies on the streets like to wear designer clothes while sipping a glass of expensive wine in one of the very picturesque cafés in one of the perfectly restaurated streets full of galleries, clothes and French specialty shops. The town is beautiful, calm, clean, very expensive and embodies all French clichés, that I know. 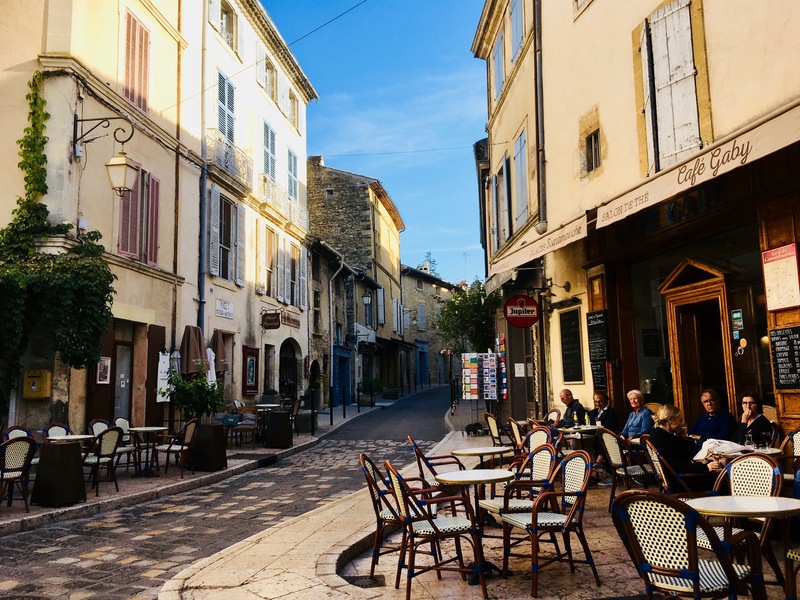 That’s why it probably attracts a lot of tourists, that prefer the quieter atmosphere of Aix-en-Provence for a starting point to discover the charm of the region and the Lavender fields. It’s a cool place to walk around for a couple of hours – chill and relax. 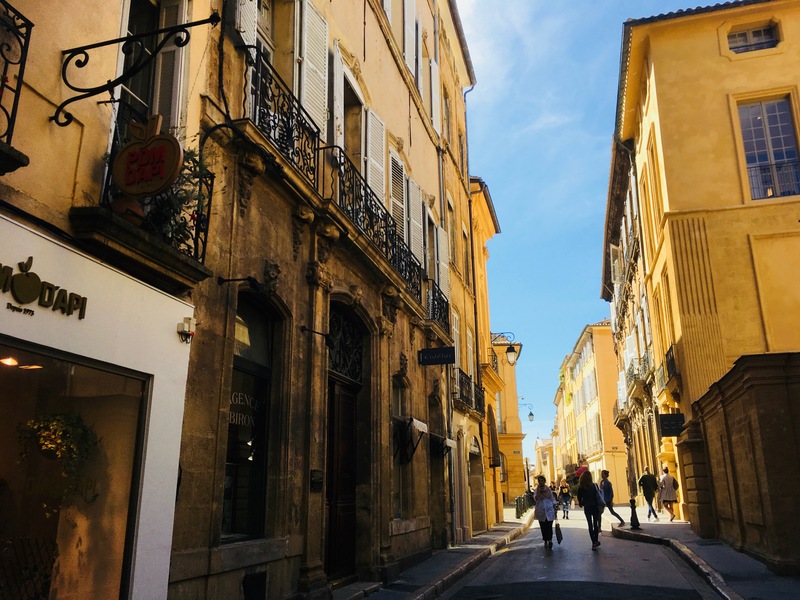 The world in Aix – as the locals call the town – is still very nice. If you want to melt completely into the French culture, you have to get yourself some of the silver Boules balls and try a game of Pétanque. It’s one of the sports, where you can see the least sportive people on French TV becoming active. I wouldn’t call it interesting to watch. But don’t underestimate the fun factor and the social function of this sports in real life. I loved it. The best thing is to try the sports in one of the villages of the Provence as for example Lourmarin. The village Lourmarin got classified as one of the „Plus beaux villages de France“ and it’s worth a detour. And if you are sick of the Boules balls, you can get involved there in other free tourist actions like looking for the graveyard of Albert Camus, stroll around the village center, smell the Lavendre fields. Check out the whole region Luberon around the villages of Lourmarrin and Cucurron. The village of Cucurron is much smaller, but still fascinating. We went there in the evening and didn’t see any people on the streets except from a crazy drunk guy, whose girlfriend just left him. But we were able to inhale the peace of French countryside and enjoy a beautiful village view. It might be even more fun to go there, if you have seen the French film „The horseman on the roof“ beforehand. The movie got filmed there – with Juliette Binoche and Olivier Martinez hanging out on some roofs in historical costumes. Just imagine, that you find a little white sandy bay to yourself, protected by rocks and surrounded by blue water and sun. But close to the city of La Ciotat? Too nice to be true. Even in the low season, we had to share “La Calanque de Figuerolles” of La Ciotat with hundreds of other tourists. For a reason. It was a pretty dreamlike picture. The water was fresh and our mood perfect. Great spot for a picnic. But bring your own food. The restaurant is not catering for budget travelers. 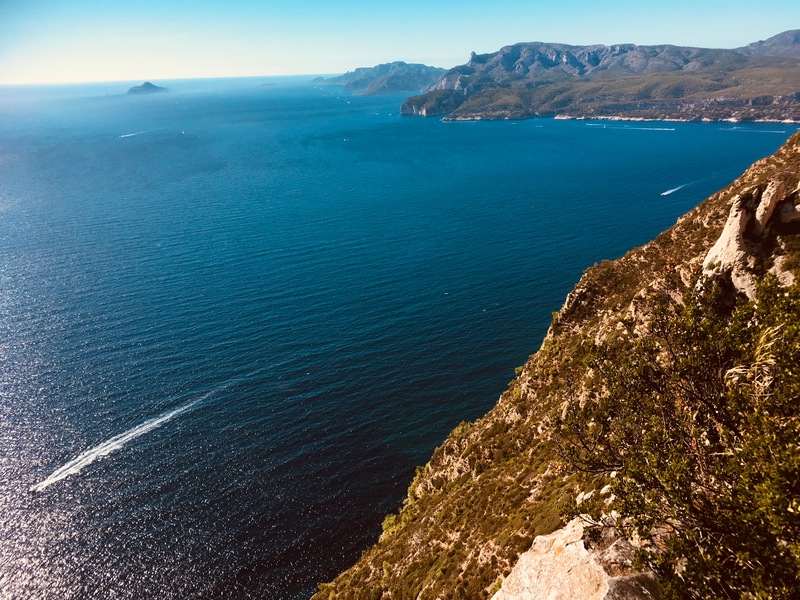 The Route des Crêtes is a 15-kilometer part of the road between La Ciotat and Cassis, that let you dream, fear, hope and enjoy at the same time. The Route de Crêtes takes you up to the cliffs for several hundreds of meters. It offers several lookout points with spectacular 360-degree views across the Mediterranean Sea and the stunning landscapes of the Provence. I loved it. I would always do a detour to see that part of the world again. I’m happy, that our French friends brought us there. Find out more about the Route des Crêtes. We got a few pitiful looks, when we made our way in Flip Flops on the walking trail around the Calanques. We were a little pissed off. Our hiking shoes were in the car. Our French friends didn’t tell us, what was coming. Just, that we wanted to go for a swim. Great. We were not too sure, if we would ever arrive at the beach alive. Right. This is a little exaggeration. You can manage the trail in Flip Flops. Just no one except us did that. Get yourself some decent shoes and you will enjoy the hike. I promise. It’s amazing. The views are breathtaking. You start in Cassis and make your way along Port-Miou, Port Pin and En-Vau. There will probably more tourists around. We went on a Sunday. That didn’t help to get some privacy. Still, even, if it is busy, don’t expect to find any kiosk or café on the hiking trail close to the beach. Bring water and food with you, if you don’t want to put yourself in a bad mood. I didn’t understand, why most people were walking up castle hill in Nice, when you can take a free elevator. We were still lazy from crouching out of the sea on uncomfortable rocks at the beach. 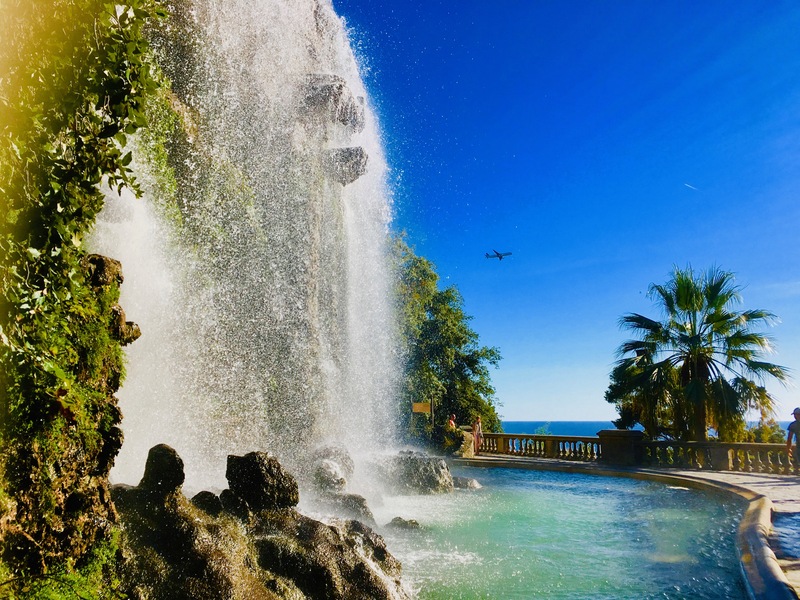 We had already walked around the attractive old town, saw the casino on the long seafront Promenade des Anglais and had played with the fountains, which are part of the green city park project Coulée Verte close to Place Masséna. Now, it was time for the Parc de la Colline du Chateau up on the hill. The sun was still hot in September. So we just got in the lift. Within seconds, we had an amazing view over the city, the sea, the harbor and the old town of Nice. It’s pretty, it’s for free. It’s a great thing to walk around the park of castle hill and put your feet into the fresh water of the artificial city waterfall. To find the elevator, just walk on the Promenade des Anglais into the direction of old town and harbor till you reach the castle hill. There is a sign pointing to the gates of the elevator, which is inside the hill. 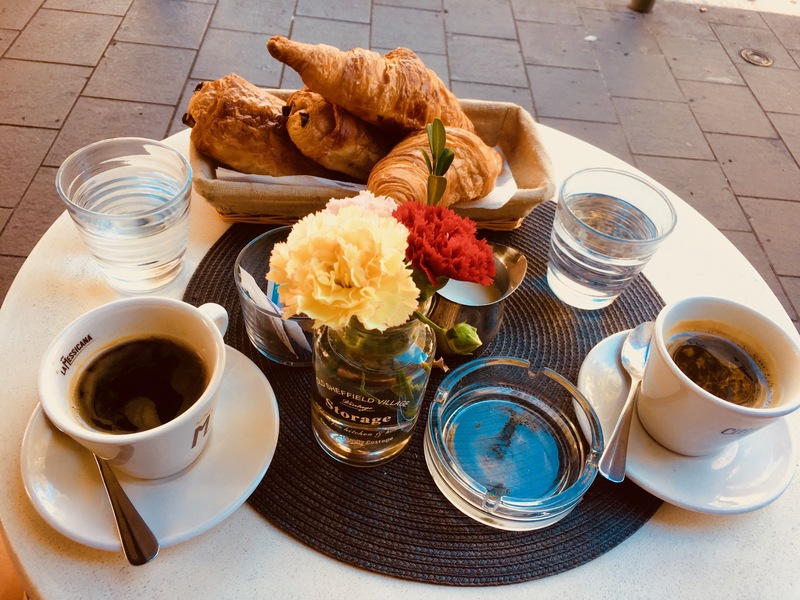 Cheap breakfast in Nice for travelers on a budget? Is there anything cheap in Nice? Well. It’s true, that you have to look a bit around for an authentic Pain au chocolate, a croissant and fresh coffee – a street view included. We found it in the café Maison Mariass located in the Rue d’Italie. We paid less than 10 Euros for French Breakfast Flair for two people at Maison Mariass. It was close to our perfectly located cheap run-down Hotel-Altair-budget-twin-room, for which we paid around 40 Euros per night in September, which is a perfect month to discover the South of France. The sun is still shining, the water warm enough for swimming and the big tourists crowds are gone.